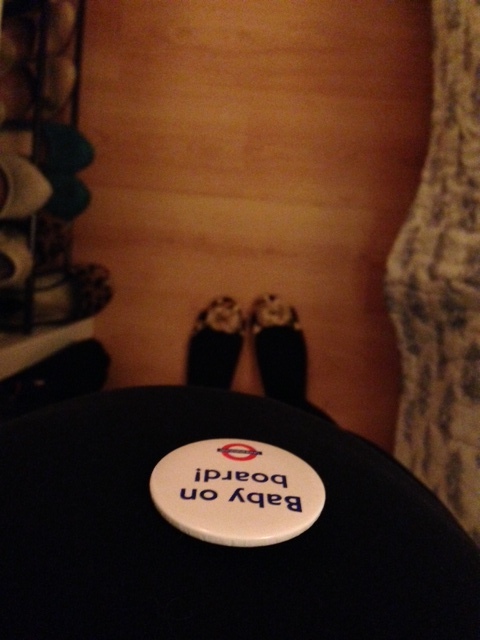 I am finally in possession of a Baby on Board badge, presented to me by R after I made several unsubtle hints about how maybe he might want to pick one up for me as some sort of romantic, ‘well done for carrying my baby’ gesture. (Some people expect diamonds, but I really have such simple needs…) Anyway, he duly obliged. Bless him. So now I have one, which in itself I love because it feels very London-ey, and is another little baby milestone I’ll remember forever. And it’ll come in handy, as, despite having enough of a bump now to be noticeable, I am still not guaranteed a seat on the tube – and, to be fair, I’m not big enough to not be able to stand easily yet. I’d just prefer a seat. But then, that was true before I got pregnant. So while I now qualify more definitely for a seat than I did before, I also feel a bit fraudulent wearing it. And, strangely, several times when people have offered me a seat, I’ve found myself saying: “No, thanks, I’m fine.” Which is ridiculous, because what I meant was: “Yes please, thank god, finally, now move along. Quickly.” And yet, it’s like a compulsion. Every time someone offers me a seat I decline it. Very odd.